While we doubt the 3-year-old construction "hole" that's plagued Seattle neighborhood Green Lake will actually become a play area—complete with 65-space unicycle parking lot—it's really the thought that counts, and the thought here is pretty clever. 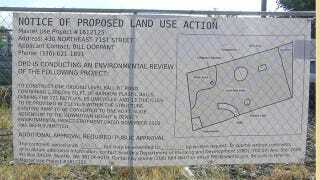 The sign [...] indicates that the empty lot will be used "to construct one ground level ball pit pond containing 1,200,000 cu. ft. of rainbow plastic balls." [Furthermore] "parking for for 171 bicycles, 65 unicycles, and 13 tricycles to be provided in 2 levels within the structure," the sign reads. "Existing ramp to be converted to one 40 ft. slide."